We welcome the addition of 2 new members of staff. Mark joins as our new foreman and Allan as our new general hand. Our MD Steve had his 15 seconds of fame when we asked MTDC to come in and film our capabilities and help us to promote our own product, The Maylan Pallet Changer. Another successful BSI visit thanks in part to some great feedback from our customers. We added to our already impressive inspection equipment with a new Faro arm, this clever bit of kit helps ensure products are within the very tight limits our clients require. Dan Lawson completes HAAS training Course. Steven Cammidge completes HAAS training Course. Installation of Haas VF2 VMC. Dan Lawson appointed as trainee apprentice. The Maylan Pallet Master changes a single pallet Vertical Machining Centre into a twin pallet unit. No hydraulic or electrical connections are required by the Pallet System, as it is totally manual in operation. The Maylan Pallet Master is designed to be retrofitted onto existing single pallet VMC’s or specified along with brand new machines. 9 new clients added in first 6 months. Datatrack production software upgraded and enhanced. Steve Weiss completes IT training course. Chrissy Ramskill completes refresher First Aid course. Maylan awarded Small Business of the Year by Corby Business Group. Maylan completes first year of trading from its new premises. Ian Dove completes Mazak training course. Milling capacity enhanced by the purchase of Mazak 530C VMC. Kevin Dawson appointed as General Manager. Stephen Weiss takes over the business from his father, and Maylan moves to Darwin Court. 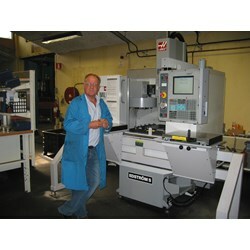 Plant investment program continues with acquisition of Mazak 200M Turn Mill.